From the Baldwin County Courthouse, go west on Hancock Street for 2 blocks or 0.2 mile (or the one large block containing Georgia College & State Univ.). Turn right on Clarke Street. Go one large block or 0.2 mile. Turn left onto Business Highway 441 North (Montgomery St.) and follow the signs for Business 441 N (turn right on North Columbia St.). Go for approximately 7-1/2 miles. Turn left on Meriwether Rd. Go 2.1 miles, just past overhead Georgia Power lines. 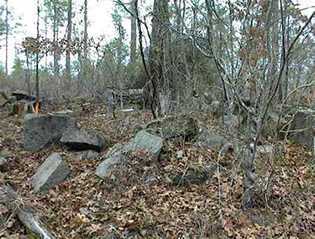 The cemetery is one block (1/4 mile) past power lines, on right side of road, and about 100 feet from road are the approximately 12 graves and the old wall which surrounds them. It is not visible from the road in summer. Marked on old county maps incorrectly as Howe. 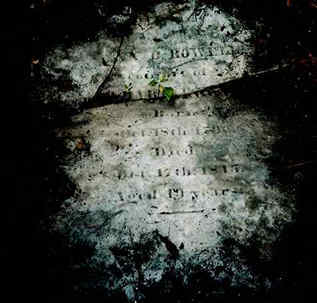 Date of death could be 1849.
possibly Edmondson Z. Brown, who built nearby house, or his son. Possibly 10 more unmarked graves in this cem etery.